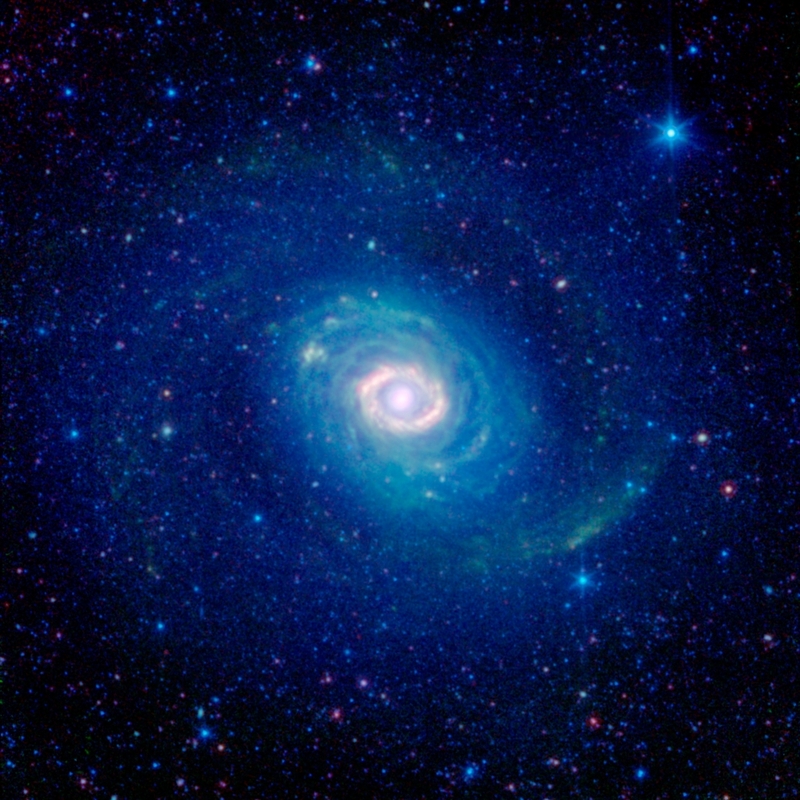 Galaxy Messier 94 (NGC 4736) as seen by the infrared eyes of NASA’s Spitzer Space Telescope looks like it has many rings, but astronomers believe there is just one. A view of the Carina nebula from NASA's Spitzer Space Telescope. 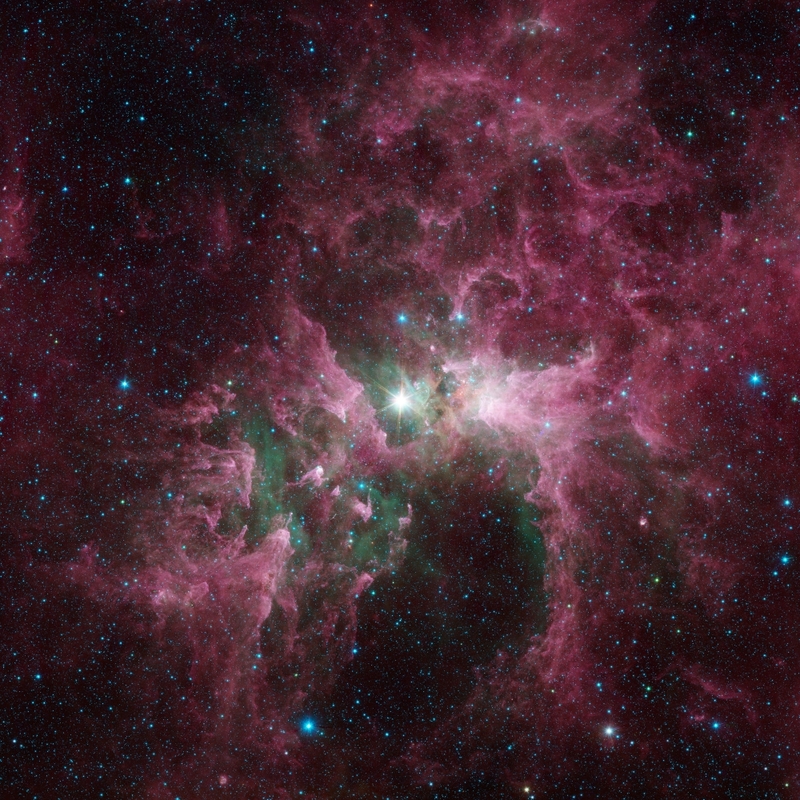 The bright star at the center of the nebula is Eta Carinae, one of the most massive stars in the galaxy. 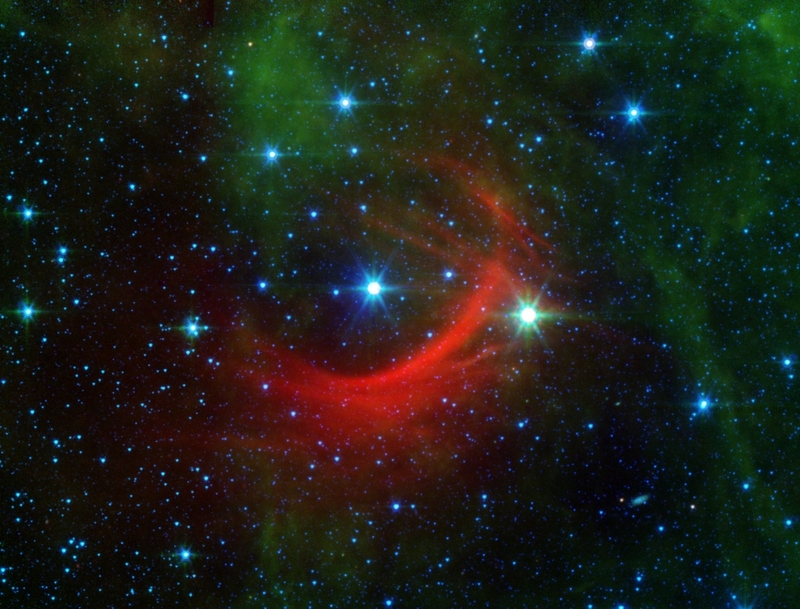 A massive, hot supergiant, Kappa Cassiopeiae is surrounded by a streaky red glow of material in its path called bow shocks, often seen in front of the fastest, most massive stars in the galaxy. The Iris nebula, as seen in infrared light by NASA's Spitzer Space Telescope. 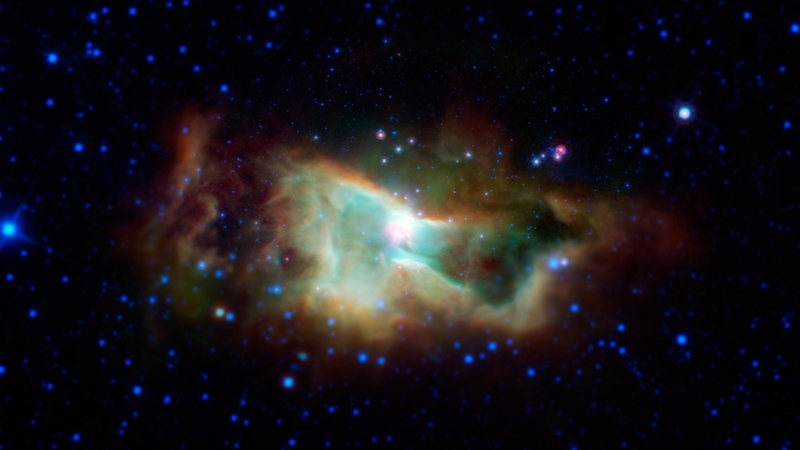 The main cluster of stars within the nebula lies 1,300 light-years away in the Cepheus constellation. Astrophysicist Matteo Cantiello answers audience questions at the first Café KITP. KITP journalist in residence Ivan Amato facilitates questions from the audience. From the moment humans first beheld the stars in the night sky, people have sought an answer to that line in the well-known English lullaby. “Humans have always tried to understand what the lights in the sky are as well as their meaning and function,” Matteo Cantiello, an astrophysicist at UC Santa Barbara’s Kavli Institute for Theoretical Physics (KITP), told the standing-room-only crowd at SOhO restaurant in Santa Barbara Wednesday night. For Cantiello, the stars are singing astonishing songs. The music begins with oscillations that travel many light-years to reach Earth. Precious information about a star’s deep core comes from oscillations created when the star is shaken by its own turbulent outer layers. The sound of these oscillations can be brought into the range of human hearing by shifting the pitch several octaves. Café KITP came to be as a collaboration between the KITP and its current journalist-in-residence, Ivan Amato, a science and technology writer, editor and communicator based in Silver Spring, Maryland. In May 2011, Amato began the quasi-monthly DC Science Café at the local restaurant and cultural hub, Busboys and Poets, to experiment with more direct engagement with the public. It is awe-inspiring, indeed, to realize, as Cantiello pointed out, that stars are similar to humans, not only because both contain common elements, but also because both live and breathe and die. He went on to explain that since 2009, NASA’s Kepler space observatory has been surveying a portion of our region of the Milky Way galaxy to discover Earth-size planets in or near the habitable zone and determine how many of the billions of stars in our galaxy have such planets. To date, Kepler has discovered more than 3,800 planet candidates and confirmed 961 planets. “Potentially habitable planets seem common,” said Cantiello. “But it’s a question of life versus intelligent life.” So hundreds of thousands of years after first contemplating the night sky, humans are still wondering about the secrets of the stars. Café KITP will take place every few months. For information about dates and topics, visit the KITP website at www.kitp.ucsb.edu.